Virginia has always been led by its stalwart defense. But is this year's cast of Cavaliers ready to break through to the Final Four? This is “Basketball Around the Beltway,” our periodic look at the college basketball teams in the D.C. area and beyond. WASHINGTON — Forgive us if we didn’t sit up and take notice when No. 2 Virginia topped Louisville 74-64 Wednesday in Charlottesville. In a winter where the Cavaliers won at Duke for the first time since 1995* (the Pete Gaudet losses don’t count on Coach K’s record), held North Carolina to 49 points and an NCAA-bound Clemson team to 36…a 10-point victory that makes UVa 10-0 in the ACC for the first time since 1981 (the days of Ralph Sampson, Jeff Lamp and Jeff Jones) is rather pedestrian. 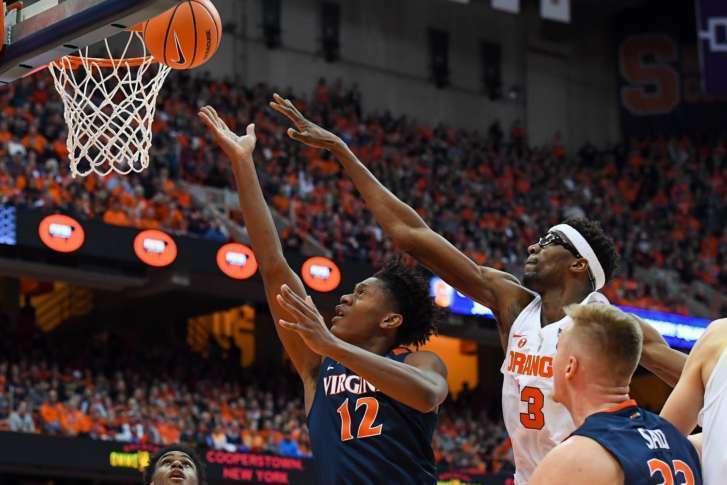 It’s been that kind of season for head coach Tony Bennett’s team, enough to wonder if this is the March they finally advance to the Final Four. Just like many thought a window closed when Sampson graduated in 1983 and Virginia advanced to the Final Four in ’84 without him, the window many though had slammed shut when they fell to Syracuse in the 2016 Regional Finals may have taken two years two reopen with a different cast. Barring a major hiccup over the next month, the Cavaliers (21-1, 10-0 ACC) are going to wind up a No. 1 or No. 2 seed. They obviously have the defense to win games in March. UVa leads the nation in scoring defense (52.7 points per game, more than four points lower than the next closest team) and allows an ACC-low 37 percent shooting, including just 20 percent from three-point range. But can the deliberate offensive style that feels like a go-kart governor produce the necessary points reach that elusive third weekend? They’ve put 59, 54, 62 and 39 points on the board when bowing out during the London Perrantes era. This year’s team has passed 70 points just twice in conference play. Their best scorer is jump-shooting Kyle Guy (half of his 284 shots are from three-point range) and heaven forbid if they miss — the 13th-ranked rebounding team in the conference hangs its hat on New Zealander Jack Salt (the 6-foot-10 junior has 16 field goals and 17 personal fouls in ACC play). And while they’re done playing Duke, North Carolina and Clemson, UVa still faces tournament hopefuls Miami, Virginia Tech and Louisville over the next few weeks. Maryland (15-9, 4-7 Big Ten) dropped a pair of potential signature-win games at home to No. 6 Michigan State (after leading by 13 at the half) and No. 3 Purdue (the Boilermakers and Spartans play just once — a week from Saturday in East Lansing). While they can make their way back to .500 in the league by beating Wisconsin, Penn State and Northwestern next week, the Terps’ NCAA resume is rather thin. They’ve got just one triumph over a top-50 RPI team (Butler in November) with one top-50 foe (Michigan) remaining on the slate. They’re also 1-6 on the road this winter. And the injuries continue to mount: Michal Cekovsky (heel) sat out the entire Purdue game while Dion Wiley (ankle) was sidelined for the final nine minutes of the second half. A potential rotation of just six scholarship players is not exactly ideal with three games over seven days. Georgetown (13-8, 3-7 Big East) will not be favored again in the regular season. Last week’s 74-73 loss at home to lowly DePaul (spell-check spits out “lowly” every time I type the school’s name) preceded a road trip that still has stops at No. 6 Xavier and Providence. Finished are the games against the Blue Demons and St. John’s (a combined 2-18 in league play). Jessie Govan is feeling the heightened level of play — after netting 19 points and 13 rebounds against a soft non-conference slate the junior forward is averaging 13 and 7 against league foes. And the Hoyas won’t face a team not currently projected to make the NCAA Tournament between now and the Big East Tournament. Virginia Tech (16-6, 5-4 ACC) followed up its upset of then-No. 10 North Carolina with road victories over Notre Dame and Boston College and are now one of five teams in the conference with five league wins. Two of the those schools (Miami and NC State) drop by Blacksburg over the next week. Since being held to a season-low 52 points by Virginia Jan. 3, the high-octane offense (second in the ACC in points, first in shooting and three-pointer production) has reached the 80-point mark seven times. Saturday’s foe, Miami, is notoriously stingy (fifth-fewest points allowed in the conference while second-best at defending the three). The Atlantic 10 quartet has VCU and Richmond both fighting for first round byes in the upcoming A-10 Tournament, while George Washington and George Mason are trying to avoid playing the first day at Capital One Arena. VCU (14-8, 6-3 Atlantic 10) has won three straight to set up a showdown of sorts Friday night – the Rams host No. 22 Rhode Island, which has all but locked up an at-large berth in the NCAA’s, should the team stumble in D.C. next month. VCU’s three straight wins are less impressive when you realize they’re against schools that are a combined 10-18 in league play and lost both games to URI last winter. George Mason (9-13, 3-6) visits Richmond (8-13, 6-3) Saturday afternoon as the Spiders try to continue one of the crazier mid-season turnarounds in recent memory. They began the season a bad 2-10 team that lost home games to Delaware and Jacksonville State, but for some reason have rebounded to boast a five-game winning streak that includes a 15-point victory at VCU. George Washington (9-13, 2-7) is experiencing growing pains under second year coach (and the first without the interim tag) Maurice Joseph. Saturday’s game with Davidson will no doubt bring back memories of the Jan. 10 72-45 loss to the Wildcats. Navy (15-9, 6-5 Patriot League) and American (5-17, 2-9) met Wednesday night with the Midshipmen rallying from 13 points down to win going away, 61-44. AU had issues with the Mids’ zone defense and shot just 5-of-21 after halftime. Senior Shawn Anderson scored 16 of his 20 after intermission — and if Navy is going to contend for home-court in the conference quarterfinals, they’re going to need solid efforts like that one (although they almost seem destined to play Army in the 4 vs. 5 game). The Eagles need a major turnaround to avoid playing in the first round of the upcoming conference tournament. They’ll also need sophomore sparkplug Sa’eed Nelson bounce back after tallying just his second single-digit scoring effort since opening night. Break up the Bison! Howard (6-17, 3-4 MEAC) has won three in a row to climb off the mat. While conference player of the week RJ Cole (27 points per game for the freshman during the streak) has provided plenty of production, the defense has been a major difference — the Bison’s foes are averaging just fewer than 19 turnovers a game during the recent streak. Will Howard be the MEAC’s Richmond and make waves in conference play after a less than ideal November and December?